The earliest collected game design document for the game. Dated September 27, 1996, this large document has everything the team wanted to do with the game -- in detail. From medals, wingmen and mission specifications to a detailed writeup of the 'Tom Dane' version of the game's story, it's all here. The October 28, 1996 Second Draft Outline for Wing Commander Prophecy. This version belonged to Billy Cain and contains his margin notes. 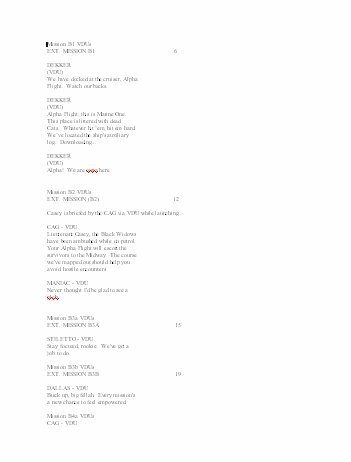 The October 28, 1996 Second Draft Outline for Wing Commander Prophecy. This version belonged to John Guentzel and contains his margin notes. 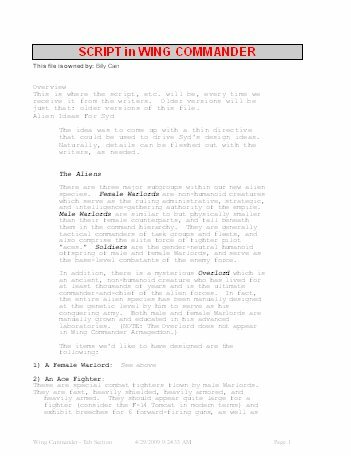 The October 28, 1996 Second Draft Outline for Wing Commander Prophecy. This version belonged to Jorg Neumann and contains his margin notes. Pages that do not contain notes have been omitted from this version, so it is only 88 pages long instead of 240. Was 600 pages of scripts too much for you? 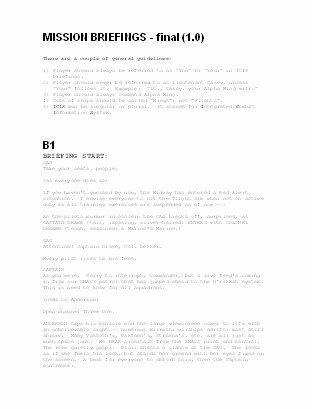 It's understandable - so check out this Wing Commander V Beat Outline. 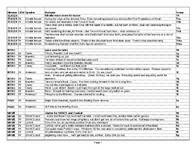 It's a short document which runs through every scene in the game and briefly explains what happens... perfect for quick reference or those who enjoy seeing Stiletto referred to as "foil girl". 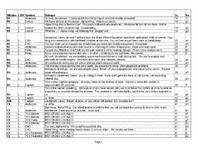 Another October 28 document - that must have been a big deadline for the Prophecy team. 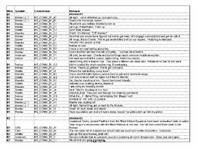 Today we see the team's comments on the Second Draft Outline... and they're really interesting. 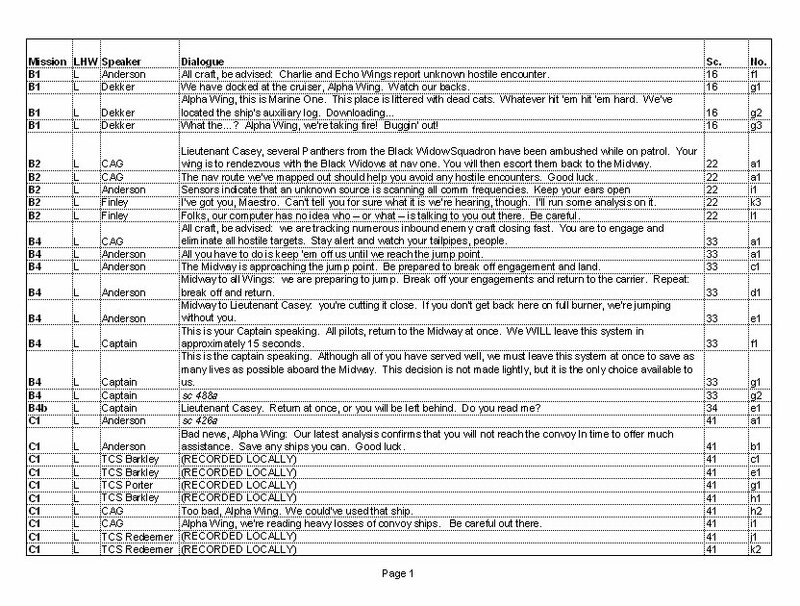 For example, Captain Johnny managed to get rid of Kilrathi Reservation planets and Dallas' awkward second callsign... but his note about Casey's lame first name fell on deaf ears. 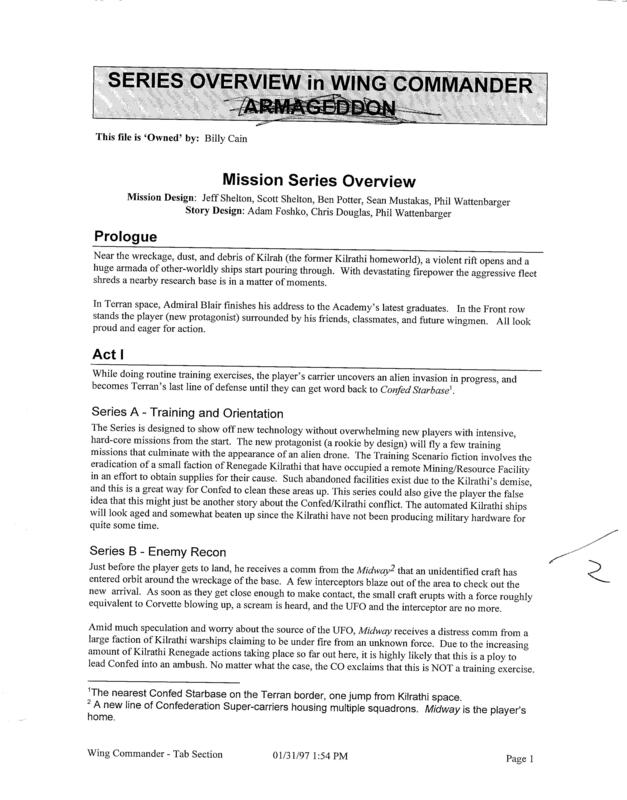 This is Wing Commander Prophecy's shooting script (the "Absolute Very Last Ultimate Final Draft") -- the version filmed for the actual game. It's dated April 30, 1997 and you will notice that it's a lot shorter than any of the earlier outlines. 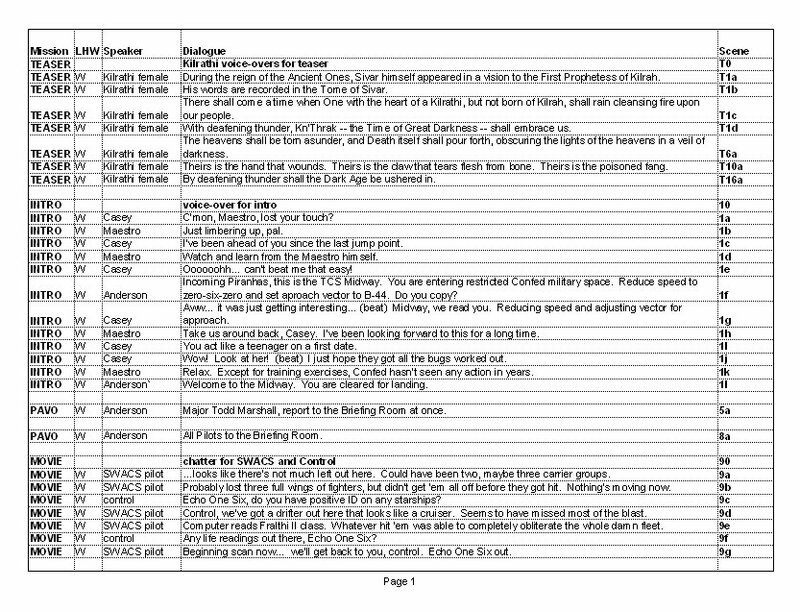 Part of the 140 missing pages are the mission outlines - but others are content that was deemed too expensive or too elaborate for the project at this point. This is similar to the plot concepts offered earlier in this series, except that it is the result of the team's three months of work. You'll find that it's very similar to the finished script in structure. Key differences include opening with a training series in which the player fights Kilrathi renegades and including a second character who is kidnapped and ultimately lost with Blair. These are the 'story'-related VDU segments. It's interesting that these are separate; presumably they're filmed in the same way by the same group of people as the regular script. 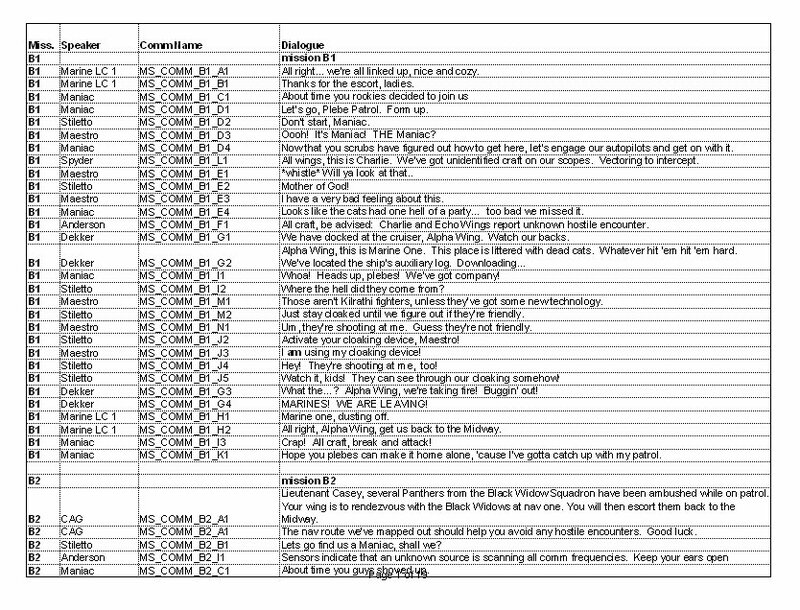 Rekindle your love of comm messages with this complete mission script -- every single 'mission specific' comm message, in order from Hrekkah to Kilrah. The 'Second Unit' of a film production is the team that does the less glamorous film work -- anything that isn't deemed important enough to merit the director. That means things like establishing and effects shots on a major motion picture; for Wing Commander Prophecy it seems to mean all the comm messages and the 'postage stamp' in-flight videos. This Excel file is a more compact version of the other Second Unit list; this one seems to have been pared down to a point where it's roughly equivalent with the finished product.